The seed scene is growing, and for good reason. 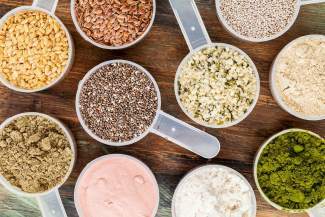 Hemp, flax, chia, sunflower, and pumpkin — all different types of seeds that are now recommended as part of a healthy lifestyle. Eaten alone, sprinkled on yogurt, combined with whole-wheat pancake batter or snuck into your kid’s pudding, we sure have come a long way since sawdust-like wheat germ. Ten years ago, if someone said the word “chia,” it was most likely followed with a “bless you,” or sparked discussion about a certain green-haired, clay pot pet. What was once targeted more specifically to the Whole Foods type of clientele, the seed craze is now so accessible that you can pick up a bag of flax seeds at your local Walgreens. Jacqui Slavin, a functional medicine practitioner based in Avon, says seeds are becoming more popular because they’re simple. “People don’t need to cook seeds, they can just snack on them — their convenience makes them more noticeable,” she said. Flaxseed is slightly smaller than ice cream sprinkles, brown and raindrop shaped. They come from flax plants and have been eaten for their nutritional benefits since the time of the ancient Egyptians. Sold whole or ground, the Mayo Clinic says flaxseed are better when eaten ground up so they don’t pass through your intestines undigested. With a high fiber content and good omega-3 fatty acids, the Holistic Health Journal stands in favor of flax seeds because omega-3 fatty acids inhibit the inflammatory response, lessening the effects of auto-immune diseases like rheumatoid arthritis. Omega-3’s also decrease your risk of heart attack and lower your blood pressure levels, according to the Mayo Clinic. You may also see flaxseed made into an oil, which needs to be refrigerated because it’s fragile. The oil can be used to make salad dressings or made into a butter spread with much less harmful saturated fat than saturated fats from animal sources. Flaxseed are now popping up in a slew of everyday grocery store items, like whole wheat bread and tortilla chips, making it as easy to get into your diet as eating chips and salsa. Hempseed, produced by a plant similar to the marijuana plant except with lower cannabinoid compounds, are praised for boosting the bodies immunity and can even help jog your memory, thanks to all its essential fatty acids. The seeds also help stimulate calcineurin, a brain enzyme responsible for brain function, according to a study from the University of Michigan published in the journal Pharmacology, Biochemistry & Behavior. More research coming from the U.S. National Library of Medicine and National Institutes of Health reveal the seeds contain as much protein as a soybean, are rich in Vitamin E and minerals like phosphorus, potassium, calcium, iron and zinc, and have all of the essential amino acids. Those who follow a vegan diet, or are lactose sensitive, can enjoy hemp milk as a creamy and protein-rich alternative to cow’s milk. One of the most functional foods in the seed family, and one that’s becoming more popular every day it seems, is the chia seed. Chia, which is the Mayan word for strength, is a slightly oval seed that may be black, grey or white, and was given its name by the ancient Aztecs. Unlike flax, the body can digest chia seeds whole, and, as an unprocessed, whole-grain food, the seeds contain healthy levels of omega-3 acids, protein, carbohydrates, fiber, antioxidants and calcium. The most interesting quality about this seed is the gel coat that expands when the seed is moistened, making it a perfect thickener. Thanks to its fibrous makeup and how it expands during digestion, these seeds also help give you a feeling of fullness that may aid in weight loss. Chia seed recipes are all the rage on social media outlets like Pinterest, where adding chia into your diet can be as tasty as whipping up some chocolate chia seed pudding; simply mix chocolate coconut milk with chia seeds and top with sliced banana. Or add a tablespoon into a morning smoothie to help hold off hunger pains ‘til lunchtime comes around. Too much of a good thing can be applied to your seed intake as well. While Slavin agrees seeds should be eaten for their anti-inflammatory benefits, they still lack the more important omega-3’s found in fish and some algae sources. The American diet is naturally high in omega-6’s that come from nuts and oils. It’s important to consume a balance of omega-6’s with the omega-3’s found in the power seeds mentioned here. Vegans in specific should be mindful that they’re getting enough omega-3’s along with omega-6’s since they don’t eat fish. “There are absolutely benefits from seeds, people just need to understand the limitations,” Slavin said.